Don't let yourself be tricked by false organic food claims. At least one significant local supplier is advertising food to its Vancouver customers as organic even though it very clearly is not, and the problem appears to be growing. This is sad because it deceives people and also undermines the integrity of the term Organic. We began to notice the problem when we heard about a well-known "organic" delivery service which was promoting pork which they described as organic. We were immediately skeptical because we know there are very few certified organic pork farms in BC, and to our knowledge we are the only one in the greater Vancouver area. When we began to look further into the matter, we viewed their website and confirmed that they are calling certain pork products organic when in fact they are not organic at all. In this particularly case, the "organic" delivery service is sourcing at least some of its pork from a Fraser Valley farm which raises their pigs inside barns and doesn't even claim to be organic. It is conventional pork. The pork is then advertised to consumers by the delivery service as "organic". Customers are being duped. This is part of a much bigger problem in BC which has become very serious for all organic food consumers. Within the past few years a regulatory "loophole" was introduced which allowed BC farmers to claim they were "organic" even though they have no certification and there is no third-party verification of their claims. The loophole allows them to say their products are "organic" although they are prevented from using the term "certified organic". Most consumers don't understand the difference, so they are easily deceived. Kris Chand describes the problem in more detail here in this interview he gave the Parksville - Qualicum Beach News. Why was this loophole introduced, and why hasn't it been closed? Very simply, the provincial government knows about the problem but so far has refused to fix it. They are the ones which regulate the term "organic" in BC and up until fairly recently the term was very tightly defined, much like the term "medical doctor" or any other regulated term. 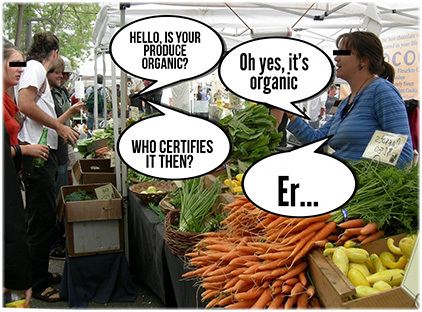 In order to call yourself organic, you had to be certified by a recognized certifying organization. But changes were introduced which loosened the controls. Was this done intentionally to undermine the organic movement? Yes or no, the damage is happening. Today, there are hundreds of small producers in BC who are able to get away with claiming their food products are "organic" even if they're not certified as such. No one can actually know if these producers are actually complying with any organic standards, because they are not certified and have no third-party verification. So you just have to take their word for it. 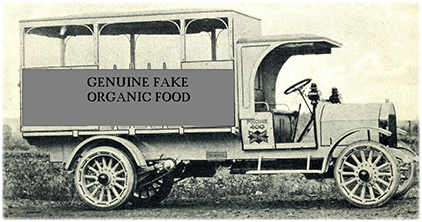 And in the case of the local delivery service which is falsely calling the pork they sell "organic" it is easily seen that they are deceiving their customers. Will any enforcement official make them stop? Almost certainly no. Until the legislation gets fixed, the problem may get worse. As conventional farmers figure out there are few consequences to misusing the term "organic" they will increasingly do it --- just like they've already done with the word "natural" which has now become meaningless. This makes it impossible for true organic producers to compete, since non-organic farming is typically far cheaper. For example, a non-organic poultry or pork farm can often turn out meat for as little as half the price of a truly organic farm, because they use a pharmaceutically-centric, synthetically-driven, industrial "farming" model whose goal is cheap food at the expense of human, animal, and ecological health. If a producer can falsely claim "organic" status with no third-party validation and no consequences for standards-violations, then eventually the term becomes meaningless and the movement dies. "Who certified this as organic?" The seller should be able to tell you the name of the organic organization which certified that the product is organic. Anyone who receives organic certification gets an organic certificate, too. If a producer has actually gone to the expense and hassle of being certified, they will be more than happy to tell you who certifies them and even show you their certificate if you want to see it. "We're in-house certified." Translation: no one certifies them, they are making it up. "We're certified by Canadian Quality Assurance." This is not an organic certification, it is a set of 'best-practices' protocols for industrial pork farmers who raise indoor barn-pigs. "I don't know who certifies us." If they don't know who certifies them, they're not certified. "Technically we're not certified but we're still 100% organic." There's no way of verifying their claim. If they really are organic, how come they don't get certified? Small producers might respond "Well, we're not certified because it's too expensive" yet the fact is most certifying organizations in BC have a sliding fee scale which makes certification very affordable to new entrants. The expensive part of being an organic farm is not the certification, rather it's the cost of compliance, something a non-certified organic producer would have to adhere to anyways if they were truly organic. The "it's too expensive" excuse just doesn't add up. Is the food you're buying actually certified organic? "Our meat is antibiotic free." Is it really? Ask them if they mean "therapeutic antibiotics" or "sub-therapeutic antibiotics". Therapeutic antibiotics are administered if the animal is acutely ill or injured. Conventional producers will often claim they are "antibiotic free" but what they really mean is they don't practice therapeutic antibiotic treatment of their animals when they are sick or hurt. Yet they still administer sub-therapeutic antibiotics in their feeds especially when the pork or poultry is very young, as a preventative low-dose medication. This is why I frequently say "You've got to know your farmer" --- there are all kinds of claims being made and the only way to know the truth about your food is to get very, very close to it. The organic food movement has become a multi-billion dollar industry in North America. As a result, many food producers are tempted to misuse the term "organic" in order to make more money, even if it means making false claims. If they can take a non-organic food item and sell it as organic, they can sell it for a higher price. In BC, the only ones standing in their way in any meaningful sense are the dedicated consumers like you, who insist on asking the right questions. If a product is certified organic, it will have a sticker-logo like one of these on it. When you buy organic produce at the Farmers Market or you take the organic delivery service, make sure you ask the question: "Who certified that this is organic?" Get to know your farmer, and refuse to do business with producers who claim to be organic but aren't certified. By insisting on only buying organic food which has been certified, you are making sure your food dollars are going to true organic producers, and in this way you are ensuring that the organic movement in BC continues growing. Thank you for supporting local, certified organic family farms.